Kerry put in their classiest display for some time to crush Armagh's All-Ireland hopes and run out comfortable 3-15 to 1-13 winners in today's opening SFC quarter-final at Croke Park. Led by the brilliant Darragh Ó Se, the Kingdom scored 2-10 in the second half to totally swamp the Ulster champions. Steven McDonnell tallied up 1-03 to help Armagh lead 1-07 to 1-05 at the interval. Eoin Brosnan had toe-poked Kerry in front with an early goal, but McDonnell's 23rd-minute strike saw his side lead by four at one stage. Kerry, despite having Paul Galvin sent-off for a second bookable offence, simply owned the second half, and goals from Kieran Donaghy (39 minutes) and substitute Darren O'Sullivan (65) saw them romp to victory. It was hard to see this coming, especially given Kerry's abject displays in the Munster SFC and the fact that they had averaged only 1-12 in their previous five games. But Kerry's quarter-final record speaks for itself. Since 2001, the green and gold have now contested seven quarter-final ties, winning six and drawing one. Armagh's pedigree is undeniable too and they were the dominant force in a first half that was full of positive football despite the awarding of 29 frees. Ronan Clarke fisted over after 60 seconds and a pass from the evergreen Kieran McGeeney played McDonnell in for his first point as Armagh steamed into the action. Brosnan's third-minute goal, created by good movement from Ó Se and Seamus Moynihan, halted the orange tide, but even though the sides were level three times in the opening 35 minutes, it was clear that Joe Kernan's men were playing better. 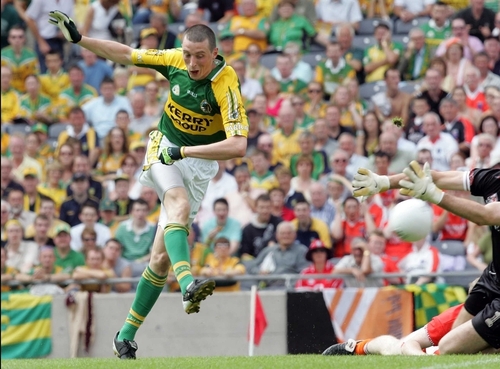 Kerry initially went 1-01 to 0-02 clear, with Sean O'Sullivan, who was making his first championship start for three years, tagging on a point. However, scores from John McEntee, Oisin McConville (free) and Aaron Kernan (free), rubbing out a Colm Cooper over, saw the sides back on terms. Armagh's two-man full-forward line of Clarke and McDonnell then combined with the latter blasting over when a goal looked on, and at the other end, the 6' 5" Donaghy, who was gnarled at by Francie Bellew for the whole afternoon, palmed off for Galvin to bisect the posts. Donaghy's battle with his former All-Star marker was an intriguing one with Armagh effectively sandwiching the Tralee youngster in the first half as McGeeney effortlessly shuffled back to Bellew's aid, time and again. The onus on Donaghy was growing as after McDonnell's goal, set up Ciaran McKeever's clever ball in and a knock down from Clarke, Mike Frank Russell - the one Kerry forward to disappoint - hit over two poor wides. A 33rd-minute point from McDonnell pushed Kernan's side 1-07 to 1-03 clear, yet Kerry crucially closed the gap with Cooper and Russell both pointing before the half-time whistle. Russell's effort should have been a goal, but Armagh 'keeper Paul Hearty reacted superbly to first deny Cooper and regain his pose to tip the rebound over the bar. It should have been a pivotal moment; however Kerry came out like men possessed in the second half – and none more so than the often-criticised Darragh Ó Sé. It was the An Ghaeltacht powerhouse's run, straight from the throw-in, that lit the touch paper for Kerry's comeback. Sean O'Sullivan was fed and angled over his second point, just 14 seconds into the second half. Kerry were back level a minute later when Russell knocked over a free. It got even better for Kingdom supporters when Donaghy claimed a high ball in from Sean O'Sullivan, fended off Bellew on the left edge of the square and drilled home his first championship goal, high to centre of Hearty's net. A McConville free nudged Armagh back within two points but there was a foreboding sense in that the northerners took nearly 12 minutes to raise their first white flag of the second half. They were flagging in the face of Kerry's pacy attacks, and they knew it. Their midfield fulcrum was gone and their young half-back line was struggling. By the hour mark, Armagh were still only a goal behind as McDonnell (0-02) and Clarke kept them in touch, yet Kerry's play was delightfully expansive with the Ó Sé brothers, Marc (0-02) and Tomas, haring up from the back to land three successive scores. Whereas Paul McGrane and McGeeney held the edge at centre-field in the first half, Darragh Ó Sé, ably assisted by Tommy Griffin, was to the fore in the second. The sending-off of Galvin – he petulantly threw a water bottle towards Armagh boss Kernan when things got heated in the 61st-minute – failed to deter a single-minded Kerry side from the prize of a semi-final spot. John Toal, operating as Armagh's water carrier, was also red carded for tussling with Galvin. A beautifully hit point from Clarke then rallied his troops and made it a two-point game. Defiantly and impressively, Jack O'Connor's men closed out the win. The Dromid clubman was clearly delighted to see all four of his substitutes on target in the final ten minutes with Darren O'Sullivan showing great persistence to rob Enda McNulty of possession and flash home the clinching goal. All Armagh could muster in response to a late barrage of scores from Bryan Sheehan (0-02 (2f)), Declan O'Sullivan and Eamon Fitzmaurice was a McConville free as Kerry ended up cantering into the All-Ireland's last-four, gaining a sweet revenge for their 2002 All-Ireland final defeat at the hands of Kernan's charges. Armagh: P Hearty; A Mallon, F Bellew, E McNulty; P Duffy, A Kernan (0-01 (1f)), C McKeever; K McGeeney, P McGrane; M O'Rourke, J McEntee (0-01), M Mackin, S McDonnell (1-05), R Clarke (0-03), O McConville (0-03 (3f)). Subs used: P Loughran for Mackin (47 mins), B Mallon for McEntee (49), P McKeever for O'Rourke (61). Kerry: D Murphy; M Ó Sé (0-02), M McCarthy, T O'Sullivan; T Ó Sé (0-01), S Moynihan, A O'Mahony; D Ó Sé, T Griffin; S O'Sullivan (0-02), E Brosnan (1-00), P Galvin (0-01); C Cooper (0-03 (1f)), K Donaghy (1-00), MF Russell (0-02 (1f)). Subs used: Darren O'Sullivan (1-00) for S O'Sullivan (53 mins), Declan O'Sullivan (0-01) for Griffin (56), B Sheehan (0-02 (2f)) for Russell (63), E Fitzmaurice (0-01) for Brosnan (69).